Do you moue and roll your eyes when someone mentions Shakespeare? (If so, then I don’t know why you read this blog.) But if you do, if you think Shakespeare is nothing but a collection of thee’s and thou’s, if you find it all just stuffy and boring and completely incomprehensible, then I have the perfect entrée for you. As the centerpiece of the 2012 Cultural Olympiad, the UK (in the form of the BBC) have created a new version of Shakespeare’s royal tetralogy collectively known as The Hollow Crown, and it is wonderful. More than that, though, it is accessible, it is totally comprehensible (both in plot and in language), and it is a joy. 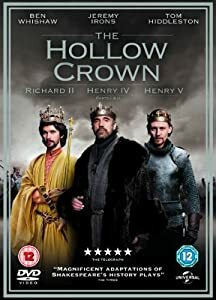 The Hollow Crown comprises four of Shakespeare’s histories–Richard II, Henry IV Parts I and II, and Henry V–and in these you will not find any star-crossed lovers, any intricate plots. You won’t find women disguised as men nor any twins separated at birth. You’ll find no trickery gone awry and no semblance of death. None of that, here. In The Hollow Crown, you’ll only find clean lines of action, kings trying to rule, subjects in revolt. You’ll find wenching and drinking, smooching and smiting, usurpations, successions, and war.